Want to sing like the pros? Always wanted to learn to play the piano? Rock out on the Guitar or Drums? We have the most qualified music teachers at our music school who will customize a private one-on-one lesson program just for you! Music lessons can be booked in various lengths of time and are once per week (same day/same time). They can be 30 minutes, 45 minutes, or 1 hour in length. We recommend young children go with 30 minute lessons, but teens and adults can do any length of time and may benefit from the longer 1 hour lessons. Don’t worry… if your schedule changes due to sports, work, etc., just let us know in advance and we will quote you some other days/times that will work for you. We try our best to be flexible and work with you, in order to make this the best learning experience possible. We also offer adult lessons, for those of you who are a little more “seasoned.” Lessons are customized and flexible to help even the most advanced students achieve their own particular goals. We balance learning and fun, making sure each lesson that you are challenged, but always ending with something fun. Click below to learn more about our classes and teachers. We have the most professional drum lesson room around, with a full size acoustic and electronic drum kit for our students. Click below to learn more about our classes and teachers. Learn the fundamentals of sight reading, technique and theory, while incorporating your favorite songs in lessons. Click below to learn more about our classes and teachers. Improve your vocal range, ear training, breath control, vibrato, and tone production to become a better singer, or speaker. Click below to learn more about our classes and teachers. That question is often asked by prospective students. Our teachers make it a priority to get to know you on a personal level and to become familiar with your personal musical needs and goals before even planning your music lessons. Then they use their new knowledge of your needs and build lessons specially tailored to you. A seven-year-old having their first guitar lesson will have very different needs than a fifty-seven-year-old taking up piano for the 2nd time after having had lessons as a child. The main reason to choose the DeAngelis Studio as your music lesson provider is that we are sensitive to the fact that every student is an individual. If you enroll here for music lessons, we will work with you to make a plan that will fit your needs and musical preferences. At the first lesson your teacher will ask you about your favorite type of music, and set goals to help accomplish whatever musical aspirations you have for yourself or your child. 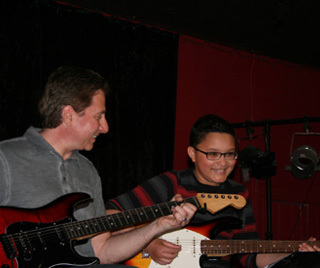 We teach all styles ranging from rock, pop, jazz, country, blues, classical and more. Our teachers have received their education from prestigious institutions such as Berklee College of Music, New England Conservatory, Lowell University, Eastern Nazarene College, and Musicians Institute. Many of our instructors have gone on performance tours of the U.S. and Europe and have well over 15 years of professional performance and teaching experience. In addition to their teaching credentials, our teachers have warm personalities, are very friendly, and strive to get to know each student on a personal level. This ensures we offer the best learning environment possible. Are Lessons Private or in a classroom setting? All music lessons are private. For groups we offer Jam Sessions and Rock School. 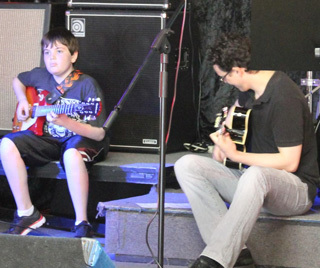 At DeAngelis Studio of Music we are very sensitive to the needs of each student as an individual. Our teachers always put musical goals first, and make it priority to get to know each student and/or parent on a personal level.